Atlus has a third 3DS game coming west. In addition to Etrian Odyssey V and Shin Megami Tensei: Strange Journey Redux, Radiant Historia: Perfect Chronology is also getting localized. It’s planned to hit North America early next year. Deep Silver has been publishing Atlus’ games in Europe, and that will likely continue here as well. 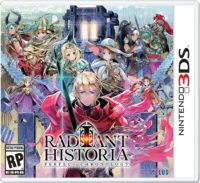 Radiant Historia: Perfect Chronology is yet another localization announcement leaked through a test page. Atlus should be following up with official news soon.